What Comes First – the Jacket or the Skirt? 1) If the skirt and jacket are of the same fabric, making the skirt gives me “practice” with the feel of the fabric. This comes in handy when I’m turning facings or collars on the jacket. 2) I’ve made enough jackets to know that I’m always kind of exhausted when they’re finally finished. I’m not sure I’d want to be facing making the matching skirt, too, at that point in the process! 3) It’s easier and just plain better to make the final fitting of the jacket if it can be viewed with its accompanying skirt. 4) And finally, well . . . I can always wear the skirt if the jacket doesn’t get completed right away, right?? 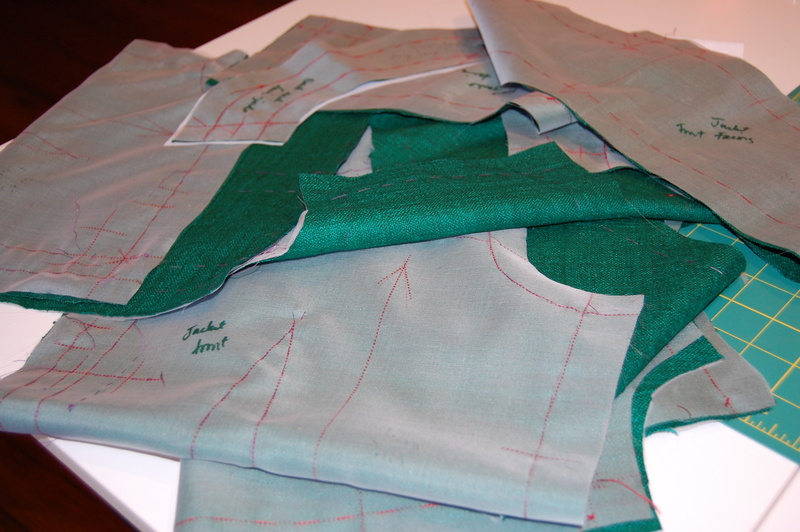 So – what about progress on my emerald green silk suit? This is the pattern I am using (View B), as written about in a former post. Yes, the skirt is finished, which allows me to give you a sneak preview. 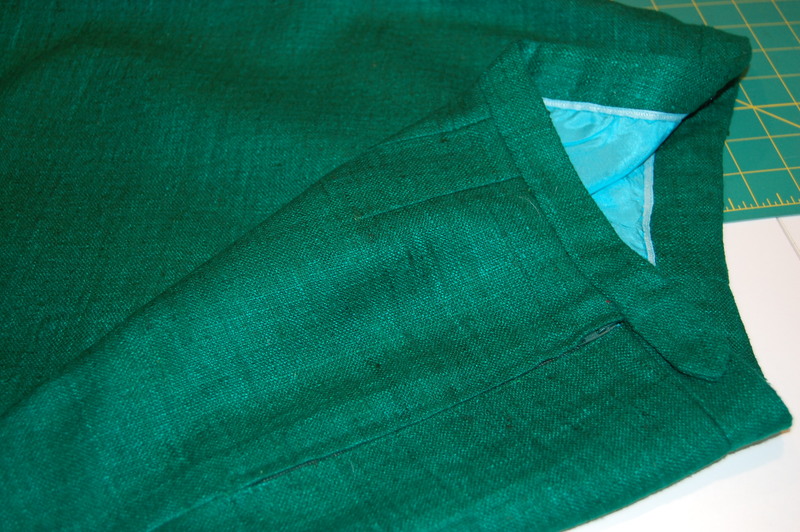 An interior view of the waistband and lining. What do you think of that turquoise china silk lining? 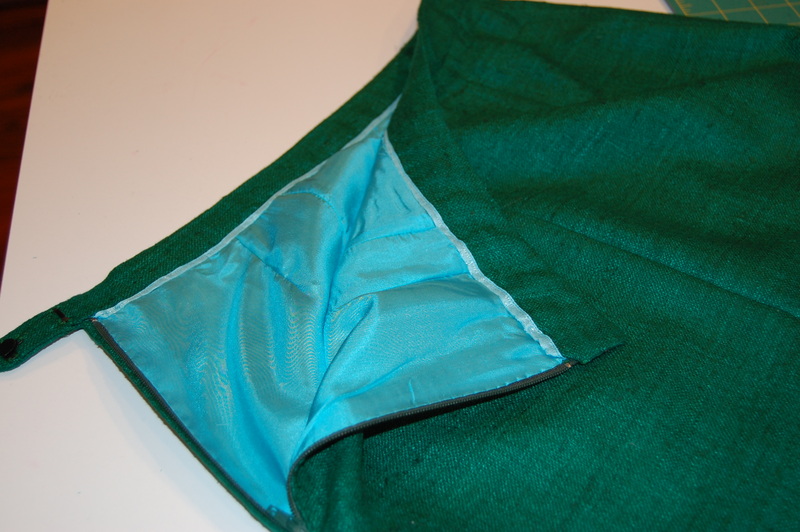 Failing to find a green lining fabric, which would coordinate or match, turned out to be an advantage. I had to choose something else – and, I must say, I love this combination. Here is a view of the hand-picked zipper. The silk organza underlining is all basted, interfacings cut, ready for sewing. 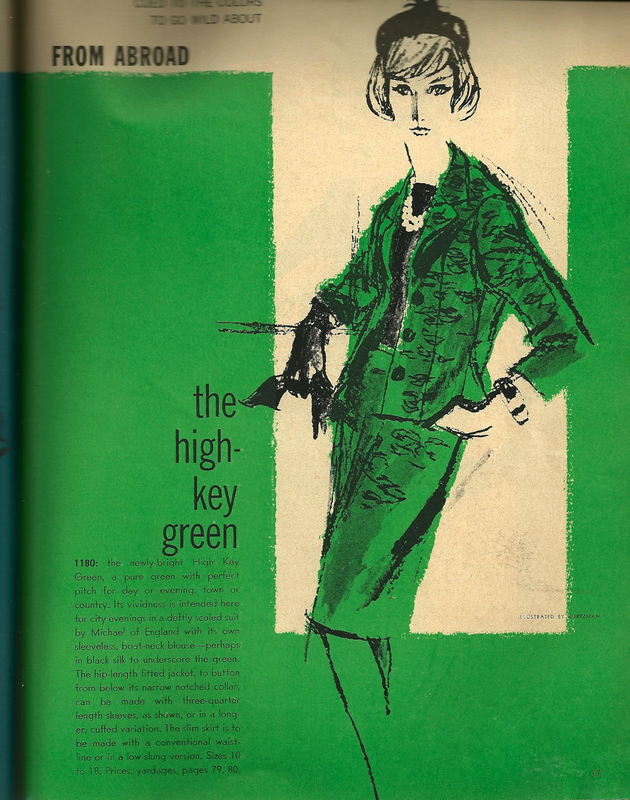 “Colors to go wild about” – in 1962 and in 2013. 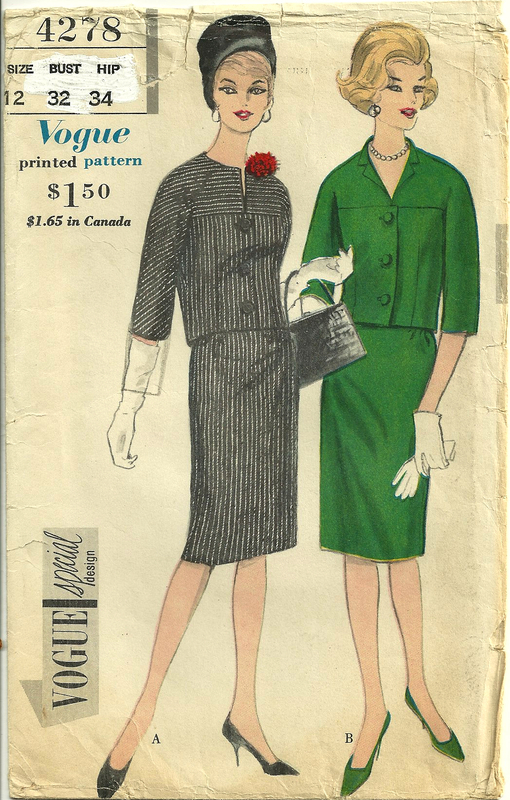 To quote: “… a pure green with perfect pitch for day or evening, town or country.” This particular design is by Michael of England, but, like the Vogue pattern I am using, it has a fitted jacket with a narrow notched collar, and three-quarter sleeves. Now I wonder what she made first – the jacket – or the skirt – or the dress? I’m exhausted just thinking about it! Beautiful color green! And I LOVE surprise linings – they always make me smile when I see them. =) Your suit is going to be beautiful! I don’t know that I could ever make myself a jacket, skirt, AND dress either! If they were all in the same fabric I would probably get bored sewing that much of one fabric all at once. I usually start with the jacket just because I usually sew from top to bottom on almost anything I make – hadn’t really thought about it before. I KNOW I would get bored sewing a skirt, jacket and dress all out of the same fabric! Glad you like the lining! Love your turquoise lining!! I always make the skirt first. But, that’s because I’ve never made a jacket yet, lol. Still working on blouses, set in sleeves and buttons, then will move on to jackets. Oh, I love to laugh and your comment made me do just that! You will definitely get to jackets one day – probably sooner than you think! Ah, this ensemble has seen many a cup of tea so far, with many more to come! So glad to know you like the color combo! Adore lining color! Just perfect. Don’t know why, but I always make the jacket first — but it makes more sense to make the skirt first as it gets you used to handling the fabric and dealing with its features on a straightforward garment. I think I’m going to really like the lining color in the jacket – where it will have more opportunity to be seen. I’m actually quite excited about it! Thanks for your comment, as always! I’d make the skirt first too, mainly because I could do it quickly and get it out of the way. I too love the turquoise lining. Yes, the skirt is definitely quicker than the jacket! Thanks, Laurie! I like the lining, too! I am definitely putting in the hours on the jacket right now – and hope to finish it one of these days! I know when I am making a two piece that if I make the jacket first I will end up wearing it with jeans before the skirt is ever ready therefore I always do the same as you and make the skirt first! I love the colours you have chosen. I mean, I don’t know if it is just my monitor’s colour display but they look so vivid!